Many people have relied on a Little Black Book since even before Casanova. The paper kind served well until the computer came along and enabled you to find one name from a list of thousands faster than you can say, “What’s-his-name.” Speed isn’t the only advantage of electronic Address Lists. For example, the Palm device can look up a name from your list and then plug that name into an item on the To Do List, the Memo Pad, or the Date Book to save you the trouble of retyping. Before you can look up a name, however, you have to add the name to the Address Book. 1. With the Address List visible, tap the New button at the bottom of the Address List. The Address Edit screen appears. 2. Tap anywhere on the Last Name line. The words Last Name become highlighted to show that you’ve selected the Last Name line, as shown in Figure 1. Figure 1: The name of the line that you tap is highlighted to show where you’re working. 3. Enter the last name of the person that you’re adding by using Graffiti or the on-screen keyboard. The letters that you enter appear on the Last Name line. 4. Follow Steps 2 and 3 to enter information on the First Name, Title, and Company lines. The text that you enter appears on the lines that you choose. 5. Tap anywhere on the Work line. The word becomes highlighted to show that you’ve selected it. 6. Enter the person’s work telephone number. 7. Follow Steps 5 and 6 to enter the person’s home phone number. 8. If you want to enter a type of phone number that isn’t shown, tap Other. 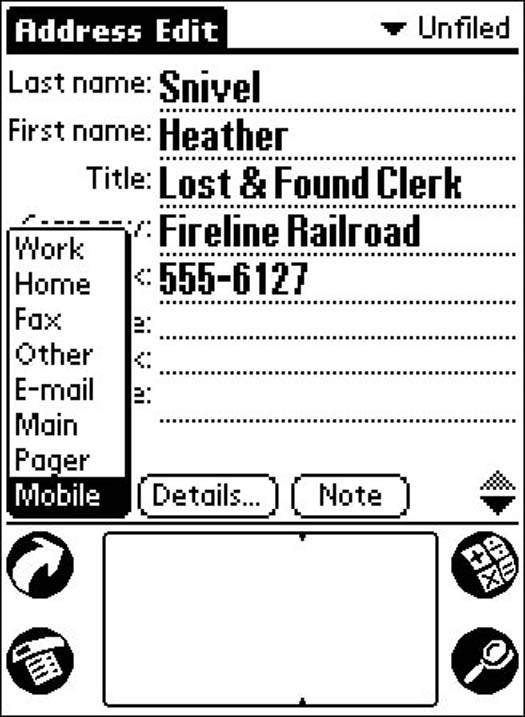 A list appears, showing the different types of phone numbers that you can enter, including pager and mobile numbers. 9. Tap the name of the type of phone number that you want to enter, such as Mobile. The type of phone number that you choose replaces the word Other, as you see in Figure 2. Figure 2: Choose the type of phone number that you want to enter if it’s not shown. 10. Enter the phone number in the Graffiti number area. The text that you enter appears on the new line. 11. 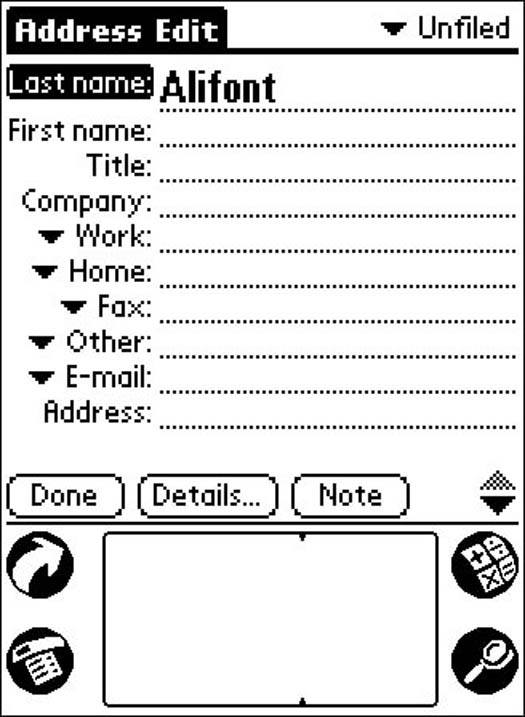 If you want to enter your contact’s mailing address, press the scroll-down hard button at the bottom-center of the Palm device. The lower half of the contact form appears, enabling you to enter mailing address information, as shown in Figure 3. Figure 3: Wait! There’s more at the bottom of the form. 12. Enter mailing address information on the appropriate lines, just as you did in the preceding steps. The information that you enter appears on the appropriate lines. 13. When you finish entering the information, click Done at the bottom of the Address Edit screen. The Address Edit screen disappears, and the Address List reappears. You probably noticed the downward-pointing triangle next to each phone number line. Whenever you see that character on a Palm screen, it means that a pull-down menu is hiding behind that button, where you can choose other options simply by tapping the triangle and then tapping your choice. Although every address record contains three phone number lines and an email line, you can use any of the phone number lines to store any of seven different types of phone numbers or an email address, as shown in Figure 2. For example, if you want to save one person’s work number and pager number but not his home number, simply tap the triangle next to Home and pick Pager from the list. Now the number that you enter is shown as a pager number. If you have a list of names and addresses in another contact program on a desktop or laptop computer, you can enter them in the desktop program as a list and then HotSync the whole bunch to your Palm device. 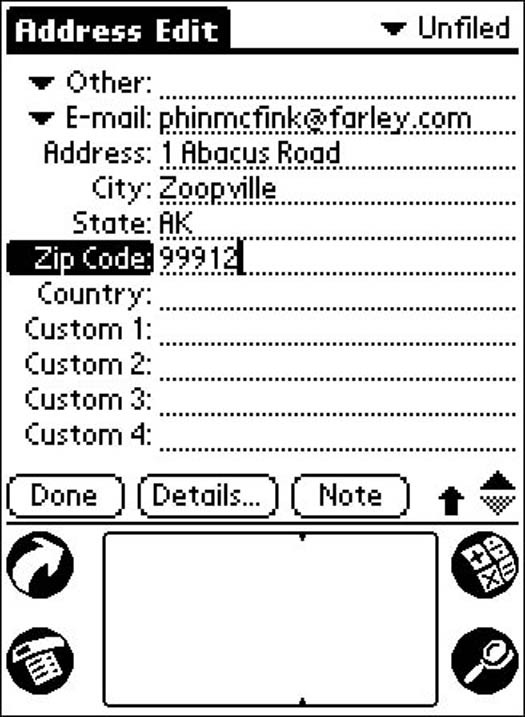 As you can see, entering names and addresses in the Palm device is easy, but when you have a large collection of names, you can save time by letting your computers take care of the job.